We finally reached Jaipur at around 11. But it took another 30 or so minutes trying to find the hostel. The taxi driver stopped at a couple of points, got out of the car with my iPhone (I had the address written down) and wandered off to try and ask locals, none of whom knew the hostel but could point us in the direction of the area. Alicia was luckily able to spot a sign post for the hostel and we were able to muddle through and eventually found it hidden round the back of a silver emporium warehouse. When I went to tip the driver (we had enough trouble with tips for one day), he didn't expect anything and even said "don't worry, it's ok". I do not get tipping. So we finally got checked in to our hotel at 11.30pm. The Royal Mrigyani Palace Hotel was lovely. We had a twin room with sitting area and ensuite bathroom for £11. Bargain. Alicia was completely shattered and decided to head straight to bed, but despite my tiredness, got distracted by the Avengers film on TV so I watched the end of that before I finally headed to bed. What a long day! We decided a little lay in was more than deserved after the lengthy day of yesterday. We got up at 11 and finally had a nice hot shower :D The hotel was gorgeous during the day, with a rooftop courtyard the looked over some of Jaipur, it's a shame we couldn't stay longer there. We got directions from reception and walked towards the royal palace close by. On the way we got a samosa breakfast, spicy again. Alicia then stood in a massive pile of cow s***. She seemed pretty determined to launch a foot towards it as the warning I gave her that she was heading for disaster went unheeded. We walked (smellily) into the palace ground. Alicia went straight to the toilet to clean her pumps. The palace was gorgeous. Big courtyards and alley ways surrounded by imposing buildings and walls. One courtyard had impressive archways with peacocks and other motifs carved in. There were 4 colourful doors in the archways that were supposed to represent the 4 seasons. We went to a couple of onsite museums including a weaponry exhibit that showed my new favourite weapon - it was an ancient one and was similar to brass knuckles but then had 2 large daggers attached either side, it looked very cool and extremely painful. We went for lunch at the palace restaurant, as it was an active palace we thought it's be a cool thing to do. As we sat down a young boy and his father dressed in traditional clothes started playing music in the courtyard and dancing and traditional dance that was similar to the whirling dervishes but with added Hindu head. I had a curry and Alicia had a pizza. The food was ok but pretty expensive so when the bill came and as they normally say in these situations "service is not included" we decided that instead of giving a tip to them(food came out at different times, Alicia's tea was cold etc) we'd give the tip to a homeless person outside. Before we could go though they collared us saying that the optional tip was in fact compulsory, apparently. Outside we haggled hard for a Auto Rickshaw to Amber Fort, the main attraction in Jaipur. On the way to the fort we passed the floating palace that was in the middle of a lake and partly underwater. We also passed the Tiger Fort that had the worlds largest cannon. 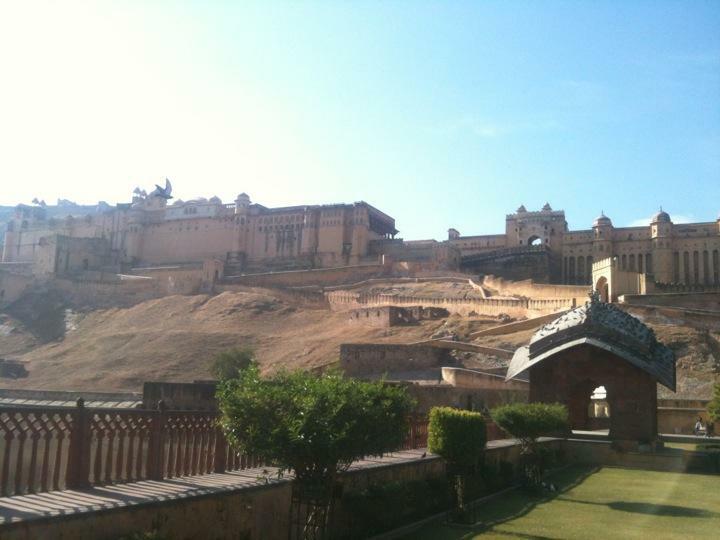 When we arrived at the Amber Fort, we looked up the hill that it resided on and realised how big it was. Huge! We walked through some gardens then up the hillside steps to the fort. We bought our ticket in the main courtyard and headed inside only to see a monkey sitting on the wall next to us, Alicia was excited, she was convinced it was more and more like Aladdin. Inside there were lots of little staircases and places to climb around and explore. We found out that many of the little alleyways led to ancient loos though. We still did manage to find our way onto the very top wall which gave us great views of inside the fort and the surrounding villages (Jaipur was too far away to see). After we'd finished at the fort we took an auto rickshaw back to hotel and waited for a couple of hours for the bus. We booked a taxi for 7:30pm and sat in the reception common area and watched Expendables on my phone. Although we were frequently interrupted by the hotel staff who couldn't seem to get that taxi right (at one point around 6:15 they came over and said "your taxi's here" - we refused to get on it). When 7:30pm did come we took to Taxi to the bus stop and it was just a case of sitting outside with our stuff until the bus arrived. Our bus was a sleeper bus with seats along one wall and beds with their own compartments along the other. We were a little disappointed to find we had seats. That quickly faded though as more and more people packed onto the bus, it ended with up to 4 people sharing a single bed and the rest crammed sitting on the floor in the aisle. It was an 8 hour journey, but the time went by ok and we even got some sleep. As per the hostel in Delhi's recommendation we asked to be dropped off outside Delhi at a place called Iffcochowk, as it was physically closer to the hostel. However when the bus stopped to let us off, it was in the middle of no where at a motorway junction...at 3am. There were some rickshaws there, and immediately we were hassled. They didn't have very good english and they started arguing amongst themselves over us. Seeing we were possibly going to have some trouble, 2 young guys with perfect English came over to help us. We explained where we wanted to go and that we only had 500 rupees left, considering how far it was we thought more than enough. After some back and forth it immerged that no one could take us all the way as they didn't have permit for in the city. They kept arguing that they would drop us off at another spot not in the city (i.e. our hostel), and wanted 600-700 for it. Rickshaw rogues. When things got a bit intense we thanked the guys for their help and we left in search of the metro station. But we were active pursued by the rickshaws, shouting at us and driving in front of us and stopping to block our path. With no one else around to help I have to admit it made me a little nervous. We spotted a big hotel in the distance and hastily made for it. The rickshaws slowly gave up and we made it into the hotel with no problem. The hotel was called Westin Hotel and was very fancy. We were obvious not their usual callers, especially not that time of night. But they were so helpful - we explained our situation and they invited us to sit down, gave us a bottle of water and made phone calls on our behalf. They first came back with the taxi was 800 rupees. We reiterated that we only had 500. They offered us a car and a driver to go to an ATM, but after a couple more calls they found us a taxi for 500 rupees. Now THAT is the kind of service that deserves a tip. I can only hope our thanks was enough. They really saved us so much trouble. More crap advice from Nirvana Hostel in Delhi though.